OSWEGO, NY – Two celebrations came together on Friday at Fitzhugh Park Elementary School. It was “Read Across America Day,” but also the birthday of Dr. Seuss. Grace Hoffman decided to read The Lorax and felt she wanted to do something special. 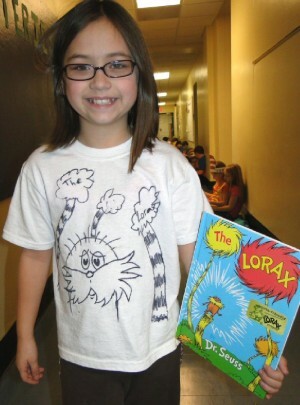 So, she drew the Dr. Seuss Lorax character on her T-shirt. It was also the opening day for The Lorax movie. Students filled the halls at Fitzhugh reading on their own or to younger students in the primary grades.